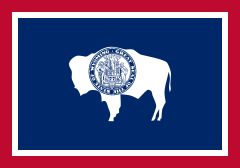 Wyoming is a state in the western region of the United States of America. The easternmost section of the state is a region known as the High Plains due to its altitude above sea level, while the majority of the state is dominated by the mountain ranges and rangelands of the Rocky Mountain West. Wyoming is the least populous U.S. state. The United States Census Bureau estimates that the state population was 515,004 in 2006, a 4.3% increase since 2000. The capital and the most populous city of Wyoming is Cheyenne. The region known today as the state of Wyoming was originally inhabited by several Native American groups. The name Wyoming is derived from the Delaware (Munsee) name xwé:wamənk, meaning "at the big river flat", originally applied to the Wyoming Valley in Pennsylvania. Although French trappers may have ventured into the northern sections of the state in the late 1700s, John Colter, a member of the Lewis and Clark Expedition, was probably the first white American to enter the region in 1807. His reports of the Yellowstone area were considered at the time to be fictional. Robert Stuart and a party of five men returning from Astoria discovered South Pass in 1812. The route was later followed by the Oregon Trail. In 1850, Jim Bridger located what is now known as Bridger Pass, which was later used by both the Union Pacific Railroad in 1868, and in the 20th century by Interstate 80. Wyoming is bordered on the north by Montana, on the east by South Dakota and Nebraska, on the south by Colorado, on the southwest by Utah, and on the west by Idaho. It is the tenth largest state in the United States in total area and is made up of 23 counties. From the north border to the south border it is 276 miles (444 km); and from the east to the west border is 375 miles (603 km). The climate in Wyoming is generally a semi-arid continental climate (Köppen climate classification BSk) which is drier and windier in comparison to most of the United States with temperature extremes. The Rock Springs massacre (also known as the Rock Springs riot) occurred on September 2, 1885 in the present-day United States (U.S.) city of Rock Springs, Wyoming, in Sweetwater County. The riot, between Chinese immigrant miners and white, mostly immigrant, miners, was the result of racial tensions and an ongoing labor dispute over the Union Pacific Coal Department's policy of paying Chinese miners lower wages than white miners. When the rioting ended, at least 28 Chinese miners were dead and 15 were wounded. Rioters burned 75 Chinese homes resulting in approximately US$150,000 in property damage. Barbara Lynn Cubin (born November 30, 1946) is a departing Republican member of the United States House of Representatives, having served since January since 1995 as the sole member of that body from Wyoming. In the 109th Congress, she was a member of the House Resources Committee and the House Energy and Commerce Committee. In the wake of the Democratic takeover of Congress in the 2006 elections, Cubin was relegated to the House Energy and Commerce Committee, as a Member of both the Health and Telecommunications Subcommittees. She is the first woman elected to Congress from Wyoming. *Add appropriate bio infobox to all Wyoming bio articles missing one. Expand : Help expand or improve the non-feature rated articles in the Noted Articles section below. Good article nominations : * No results were found. *Add a picture to an article in the list of requested photographs in Wyoming (Most towns in Wyoming are still on the list) or improve one of the articles with 0 or 1 images on the list of needed pictures. Coordinate with Wyoming Portal to provide quality articles for use.